Hot discussions on Tabs vs. Spaces in Coding - Which person are you? Pros & Cons of Tabs vs. Spaces vs. a Mix of both! How does this affect your hiring employers? So where did this all begin at the first place? On defaultly-configured Unix systems, and on ancient dumb terminals and teletypes, the tradition has been for the TAB character to mean move to the right until the current column is a multiple of 8. This is also the default in the two most popular Unix editors, Emacs and vi. There was an episode in "Silicon Valley" last year, as they built an entire episode around one of the most obscure fights in programming, which indenting technique people use - Tabs or Spaces or a mix of both. This has been a big debate in almost all the workplaces and in most of the interviews, you'll be asked about this question, at least once - Which coding style do you use? Tabs or Spaces. Obviously, answering the question is a little tricky, because, based on what you answer, there will be a decision taken by the employer or your hiring manager, if he's a technical person or being "fed" with technical stuffs to be asked during the interview (which would make things worse, as the person will come with a preoccupied mind that he needs to hire only one type of candidate, not letting the interviewee to justify their point of view). Talking about code, most (yes, some people do exist) people set their Integrated Development Environment (IDE) or Text Editor to use a mono-space font. And regarding my justification for the most, yes, I have seen people who use Times font for working with source code and make their as well as the developers (who help them) life in a burning hell. Coming back to the Tabs and Spaces, let's start the debate. Any space, let it be in any editor or environment, will take one single column. It is the developer that decides how the code should appear with the level of indentation, if the space approach is used. Let it be vim, Git Commits, Sublime Text, the code looks always the same. But there's a downside for spaces. Since they use single column to represent only one column, things might go bad if they need to represent a full indented SLOC, where multiple spaces take up to show one single indentation. 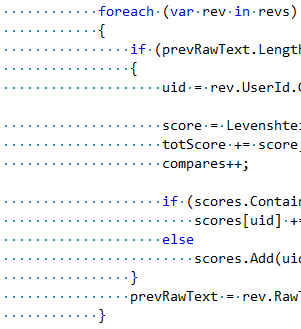 If the developers are concerned about how the code should be indented, then spaces are the best approach to go. On the other hand, a Tab may be either 4 Spaces, 8 Spaces or 2 spaces. This is set by the configuration of the editor and it is not universal, although most of the editors and browsers use 4 spaces to display a tab character (8 spaces in source code of browsers). And this is changing rapidly with time. 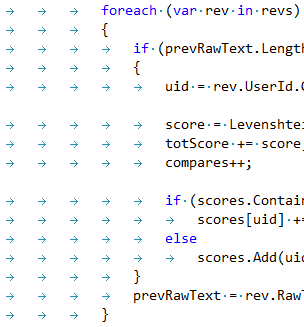 The good thing about Tabs are that they are not spaces and they are mainly used for indentation. De facto standard for indentation. Configurable to any number of spaces. Better control over the indentation. Allows mistakes to be noticed easily. Doesn't have inconsistencies (you might accidentally add 3 spaces instead of 4). Easier on keyboard (one key stroke vs. four key strokes). Code is stored in a compact form. Gets formatted as per the dev's preference. Upon saving, goes back to the compact form. Easily resizable and can be realigned according to needs. The above coding style not only looks good but also it is an efficient way to organise code, instead of using a huge number of spaces and wasting the code space. 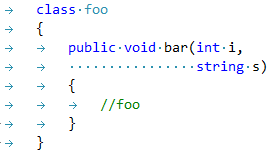 Using code compressors are a different story altogether, but this is pain! 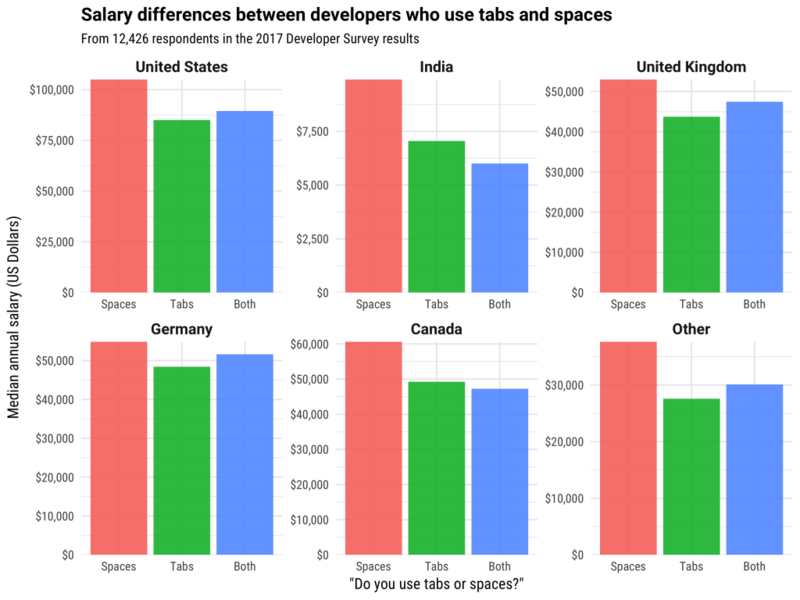 Stack Overflow, the number one resource for developers for literally anything had recently published an article Developers Who Use Spaces Make More Money Than Those Who Use Tabs. 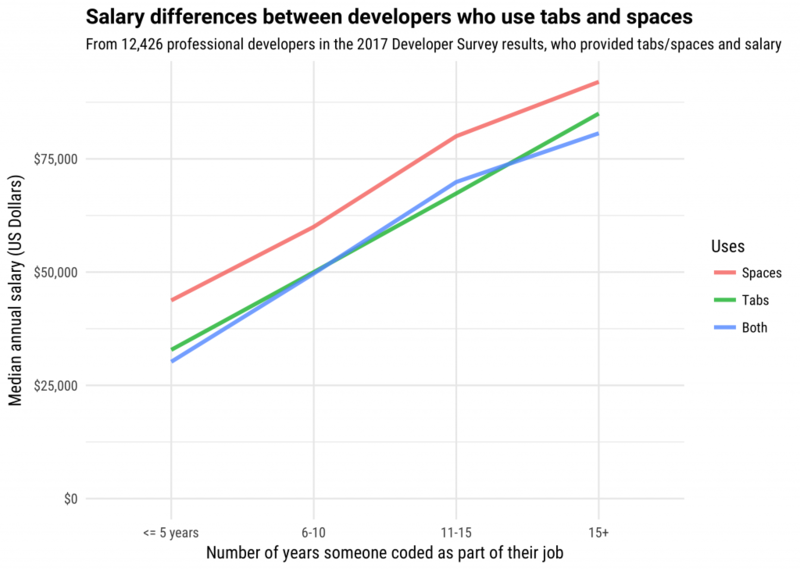 It is really interesting to know that employers have started looking into the coding approach used by developers and made it a concern too. That's actually good for some, as it might be a seed for beginners to learn the right way. Or mixing both and watch the source code burn! Everyone knows you can leap further with tabs! Thankfully I use tabs. As usual, let me know your views in the comments below! Happy coding folks!